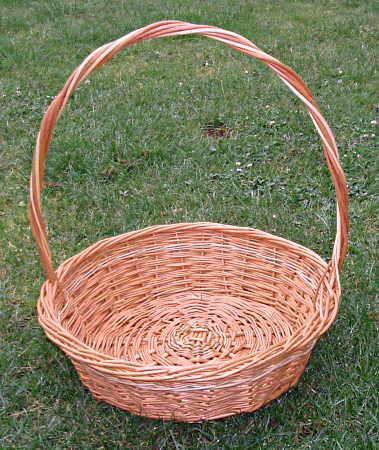 Please note that due to a limited supply of both willow and time I'm not making as many baskets as I used to. At present I'm only making bicycle baskets which appear in stock on the website of our online bicycle parts and accessories shop. 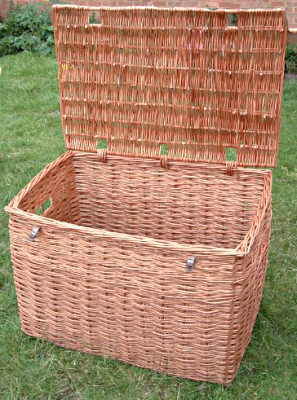 Click here to go directly to the baskets which are currently in stock. We have two other small businesses with which we support ourselves, selling tried and tested bicycle components and organising cycling holidays in the beautiful area in which we live. Please click on the buttons to the right for more information. Every basket shown here was made by myself in my own workshop. 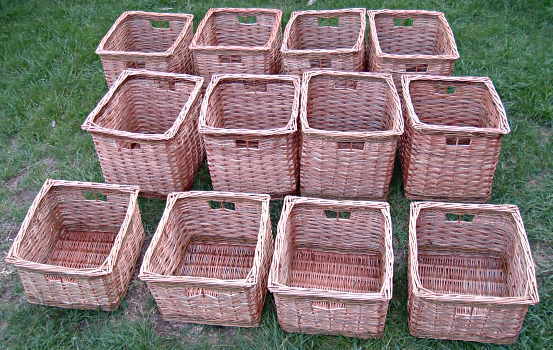 They are high quality, long-lasting and, above all, practical baskets. 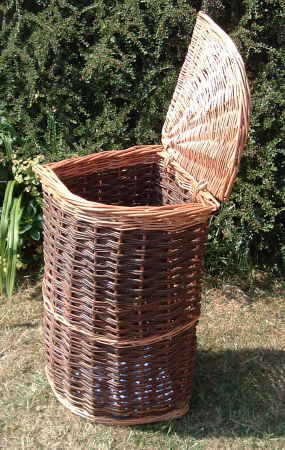 I've made many baskets in very many different shapes and can make special order baskets for you too. Just let me know what your requirement is. I've sent baskets to people all around the world and some customers have been kind enough to send photos back to me of their baskets in use. Other photos I've taken myself before sending the baskets. 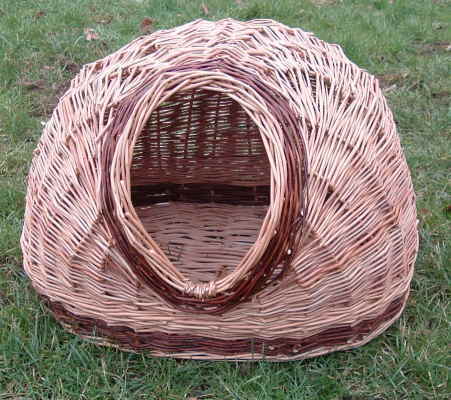 See the repairs page for more unusual baskets. 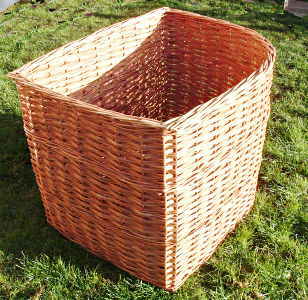 You can also look at my standard line of domestic baskets or bicycle baskets. 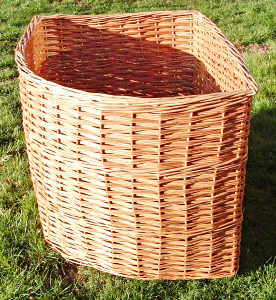 If you need an unusual basket, please contact me for a quote. 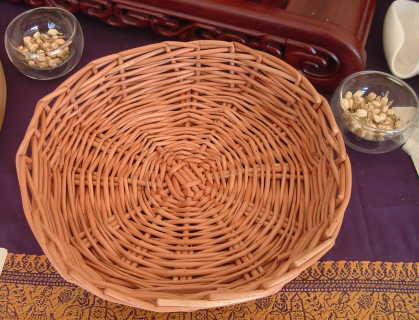 This corner fitting linen basket with opening lid was made with black willow to match a customer's decor. 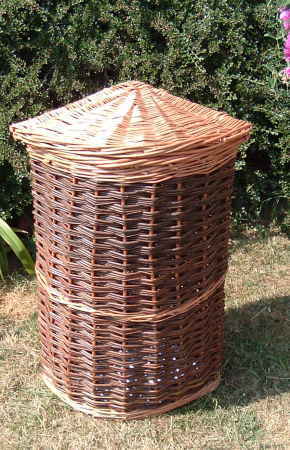 This basket was made with internal dividers for separate items to be stored. Basket for favours at an Italian style wedding. 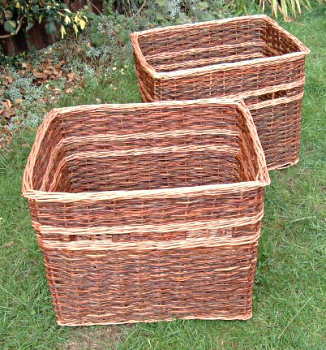 Two sets of storage baskets made to order. Those on the left all have a thin stripe of red willow at the top. Those on the right are mostly of red willow. 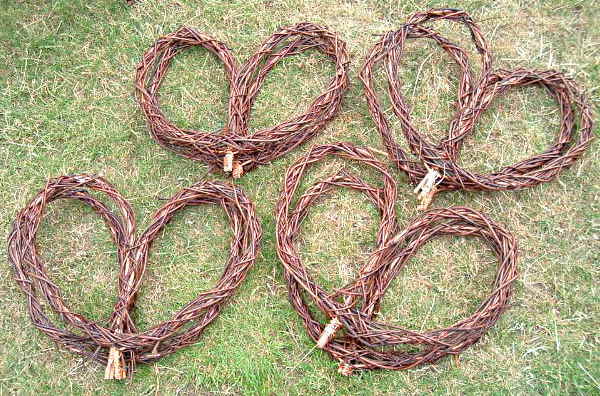 Heart shaped wreaths for flowers at a wedding. 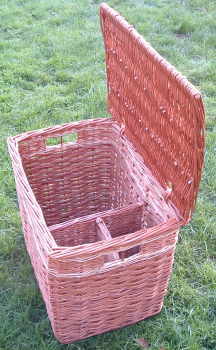 This basket was made to fit a Carry Freedom bicycle trailer. 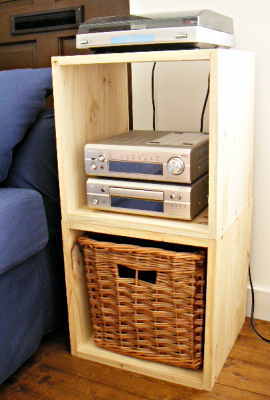 The basket uses the plywood top of the trailer as the base of the basket. 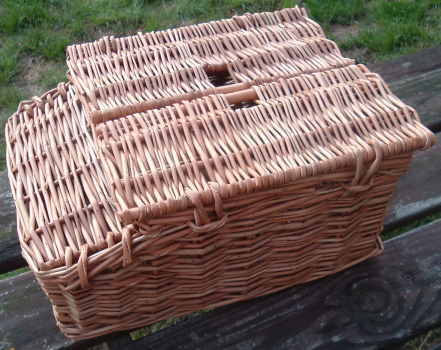 I can make baskets to fit onto wooden bases like this on request. 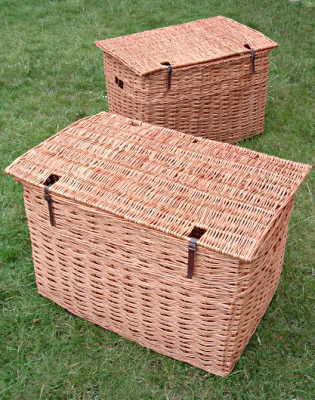 These two baskets with lids were made for the storage of monks robes at a monastry. 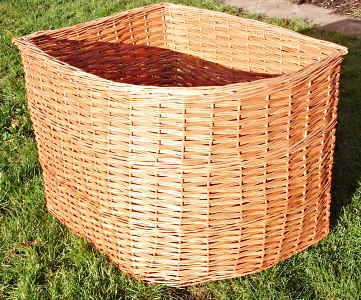 This basket is one of a set made to fit the customer's furniture. 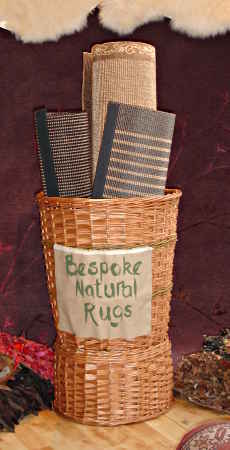 I made a set of baskets like this for retail display of rugs made of natural materials sold by Mellau Carpets UK. There is a gap underneath for storage of a book of samples of material. 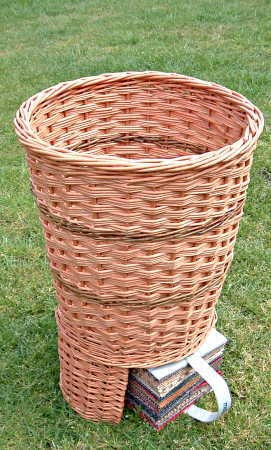 Three views of three sided log basket to fit into a corner. 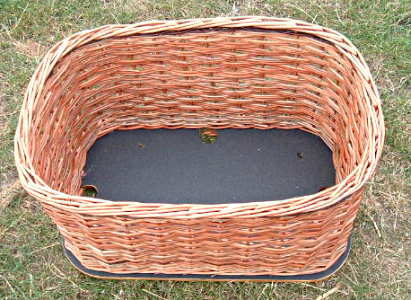 An unsual rear bicycle basket with two opening lids. This was designed to fit a customer's document file. I have many photos of customers bikes with baskets fitted. 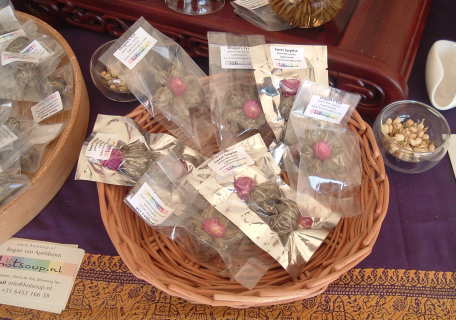 A willow tray made for displaying the delicious flowering tea sold by hotsoup.nl. 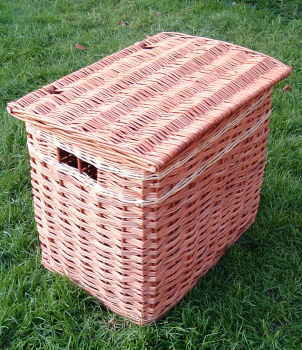 If you have a photo of one of my baskets in use and would like to see it here, please send me a copy. 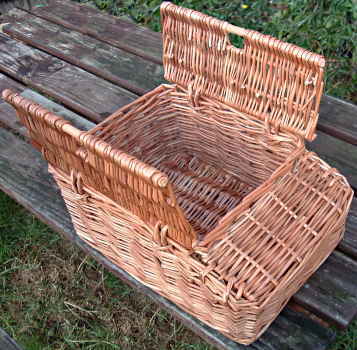 There are also photos of some custom baskets on the page of baskets on bicycles.